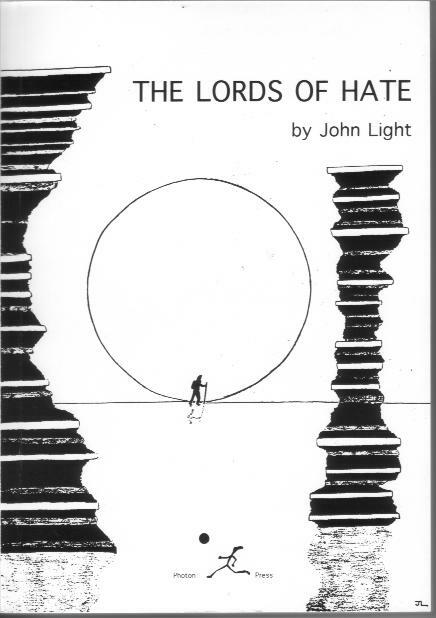 "John Light's latest novel The Lords of Hate blends the breakneck galaxy-hopping action of vintage pulps with philosophical musings on mortality, reality, destiny, free will and scientific ethics. This second volume in Light's Annals of Lavandrel reintroduces Prince Alorn, his bride Annalor. and many other key characters from The Well of Time. Despite plot similarities between the two books - visionary dreams lead to a quest ending in a crucial confrontation - Lords is more complex, thematically more ambitious and darker in atmosphere. This time it's Annalor who is plagued by nightmares, of a cry for help from an icebound world menaced by terrifying sea creatures. Annalor, Alorn and the sage Merian go on a mercy dash to a distant solar system; but Alorn's mission to nullify the Beam of Hate that's causing all the trouble plunges him into an alternative cosmos of pure emotion. Here, things get pretty trippy, with half the story unfolding at various levels of unreality. "Virtual" events directly influence the material world, expanding the theme of spiritual harmony overcoming physical chaos first explored in The Well of Time. Light's exuberant imagination garnishes this multilayered parable with satisfyingly quirky characters and concepts, including a ship's computer that composes contemplative poetry, and the titanic hollow Shell World, whose docile inhabitants are compelled to wage endlessly pointless wars. Looming over all is the coldly megalomaniacal "Psychologist', a disembodied super-intelligence whose only use for organic life is to experiment on it. Though the author's style sometimes veers towards the academic, and his sense of pace can be slightly erratic, the interweaving of plot-threads ensures cliffhanger situations aplenty to help keep things lively. As in Well, nostalgia for an idyllic rural past contrasts with wide-eyed wonder at the possible benefits of advanced technology, and dire warnings about its possible dangers. The role of science and scientists in humankind's affairs is repeatedly reexamined: scientist as Creator, as self-styled god; science as magic; knowledge as power. With the dehumanised Psychologist representing the essence of intellect without conscience, the implied moral seems to be that true wisdom requires a soul as well as a brain.